Rhubarb sneaks dessert while longing for elves. | ostrich milk. Study: RHUBARB. 2.7 Rhubarb-skyr panna cotta with ginger-poached rhubarb. Infuse the cream. In a saucepan, warm cream. Scrape seeds from half of a vanilla bean into cream and allow to infuse for about 10 minutes. Add milk. Add sugar slowly, stirring until sugar is dissolved. Keep warm, but not scalding. Make a gelatin base. Reserving the remainder of the juice, sprinkle one packet gelatin over 3 tbsp. 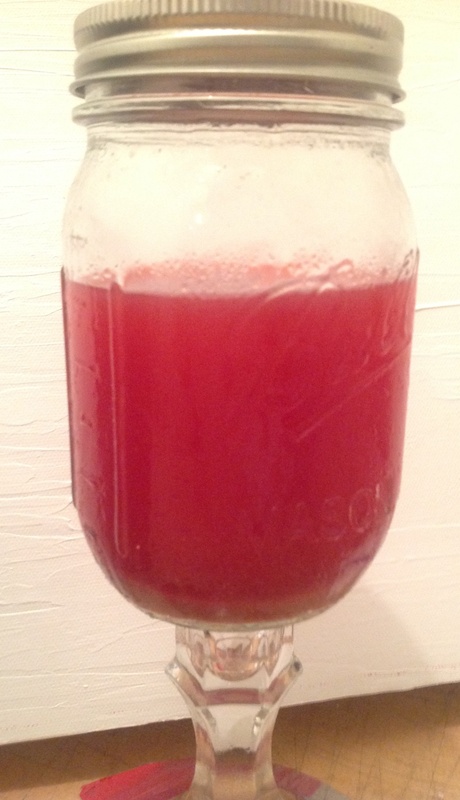 chilled rhubarb juice in a small bowl. Allow gelatin to bloom for about 10 minute. Mix the skyr base. In a large bowl, whisk the remaining rhubarb juice into the skyr. Incorporate everything. Add the gelatin base to warm milk-cream mixture and mix. Pour into bowl with skyr. Whisk. Pour into mold and allow to set overnight. Skyr panna cotta with rhubarb gelee. Slice a thumb-sized piece of ginger finely. In a saucepan, dissolve 1 part sugar in 1 part water. Add the ginger and allow to simmer without boiling for 20 to 30 min. While syrup infuses, clean and trim rhubarb. Slice rhubarb into 2 to 4-inch pieces.Narrower stalks of rhubarb work best for this. 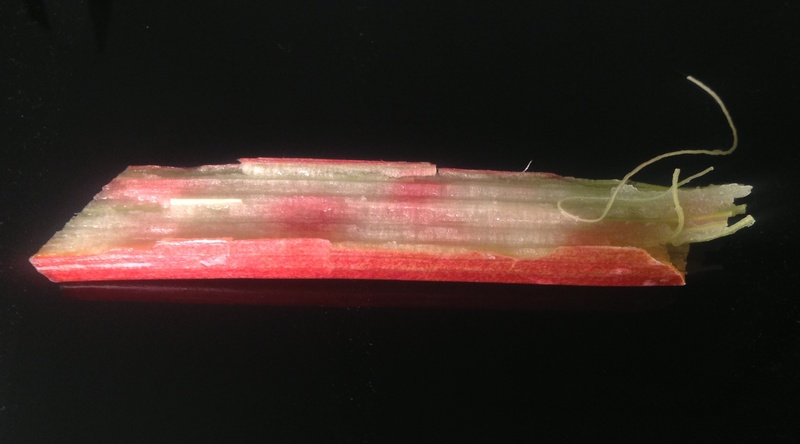 Prepare a cold water bath: overcooked rhubarb is a stringy, gooey mess. Increase temperature of syrup to near-boiling (the sugar may begin to caramelize). Add rhubarb to hot syrup. Remove rhubarb from syrup into cold water bath with slotted spoon just as peel begins to slough off, between 5 and 10 minutes. Allow rhubarb to sit in cold water for 1 – 2 minutes. Drain. Reduce the remaining syrup. Pour syrup over panna cotta and add rhubarb. 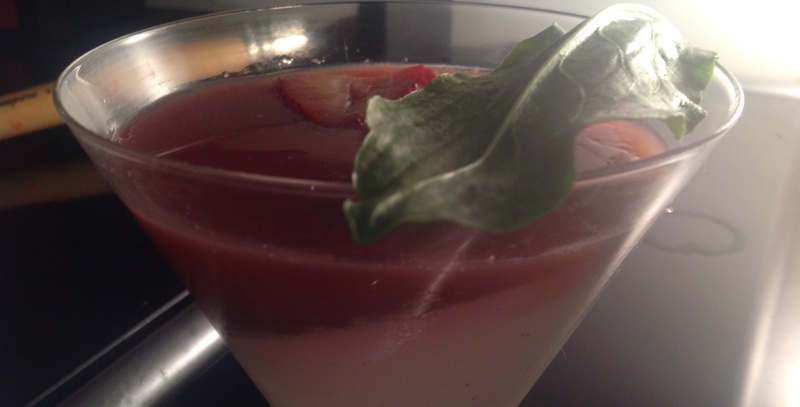 This entry was posted in Rhubarb, Studies and tagged ginger, juniper, molecular flavor pairing, nordic, Panna Cotta, skyr. Bookmark the permalink. Rhubarb and juniper, in a gelée.